LetsGoDU: Could Kale and Bacon Cure Attendance Woes? Could Kale and Bacon Cure Attendance Woes? The Atlantic published an interesting article, Kale: What It Takes to Get Students to a Women’s Basketball Game. 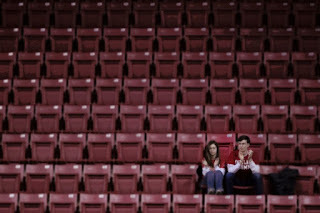 It addressed slumping attendance, especially for women's collegiate sports. In response to this trend, universities have attempted to incorporate innovative strategies to boost attendance with spectator giveaways. At DU, swimming, volleyball, tennis, and men's soccer have loyal followers who plead with anyone who will listen that more people should go to these events. Yet, many of these venues remain as quiet as Anderson Academic Commons during Finals Week. In some respects, DU has bucked the trend with relatively strong attendance for women's lacrosse, women's soccer, and women's gymnastics due to local promotions and the growing local popularity of these sports. Volleyball has shown the potential to grow exponentially with growing local interest and local clubs on the rise as well. DU does not have a basketball heritage. Denver is not a college basketball city. "If they just won more!" Basketball, once the hip urban sport, is not relevant to a University strong in suburban sports. There are too many other things to do during a Colorado winter. The chicken or egg excuse - Who wants to go to an empty arena? The quarter system does not lend itself to many of these winter sports. 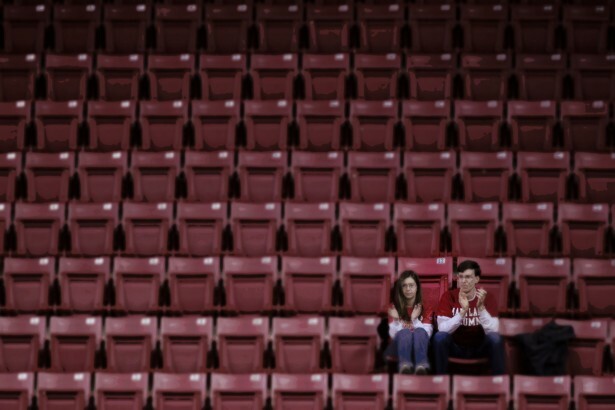 Attendance at women's basketball games is down across the country. When the women’s basketball team at Georgetown University announced that it would host a kale-themed "Hail to Kale" game, attendance tripled. Perhaps the inherent strangeness of using something like kale to lure fans to a basketball game was the very trick that made people think about going to the game. "With regard to basketball in particular, some writers have argued that sports enthusiasts don’t like to watch women outfitted in masculine outfits and engaging in ostensibly "unfeminine" acts like elbowing and pushing. Instead, they arguably prefer watching women play sports like tennis, where they wear skirts, or beach volleyball, which typically entails little more than a bikini. Other analysts say that the small number of female sports journalists has led to less overall coverage of women’s sports—and that the limited media attention also takes a toll on these teams' popularity. A 2012 report commissioned by Associated Press Sports Editors assigned media outlets an F grade for gender representation among sports columnists and editors. Attendance at women's basketball games has been tumbling since the 2006-2007 season across the country. Of course, free food always works for students. According to The Atlantic article, when Kansas State University passed out free bacon at one of its home women’s basketball games in 2013, student attendance more than tripled. We had a whole crowd that wasn’t women’s basketball fans who came for the bacon and then stayed," said an athletic official. "The energy felt substantially more [intense] than past games." Not if you are vegetarian!